Lamar Community College's Beta Eta Gamma chapter of the Phi Theta Kappa Honor Society welcomed 14 new members in an induction ceremony on November 2, 2017. The new inductees included Chet Adams (Hoehne), Harley Anstead (Ignacio), Michelle Batista-Majalca (Johnstown), Jenaye de Seve (Canyon Country, CA), Dillon Fisher (Springfield), Tyler Geddes (Lamar), Shelby Hawkins (Elizabeth), Miles Hilton (Albuquerque, NM), Laura Lindholm (Eads), Haleigh Prosser (Wiley), Adrianna Ruggieri (Stockton, NJ), Mayrene Slatton-McCoy (Lamar), Celia Tamayo (Lamar), and Sarah Trosper (Lamar). After LCC President Linda Lujan welcomed new members and congratulated them on their accomplishment, guest speaker Representative Kimmi Lewis addressed the inductees. Representative Lewis shared her excitement at the students' achievements, and spoke of some of the lessons she has learned through her years in the businesses of cattle ranching and trucking, as well as raising six children. She also emphasized the importance of remembering to "look behind you" as you are moving forward in life and planning for the future. Phi Theta Kappa is an international scholastic honor society with a two-fold mission: to recognize and encourage the academic achievement of two-year college students and to provide opportunities for individual growth and development through participation in honors, leadership, service and fellowship programming. Founded in 1910, it is the oldest and largest academic honor society of its kind. 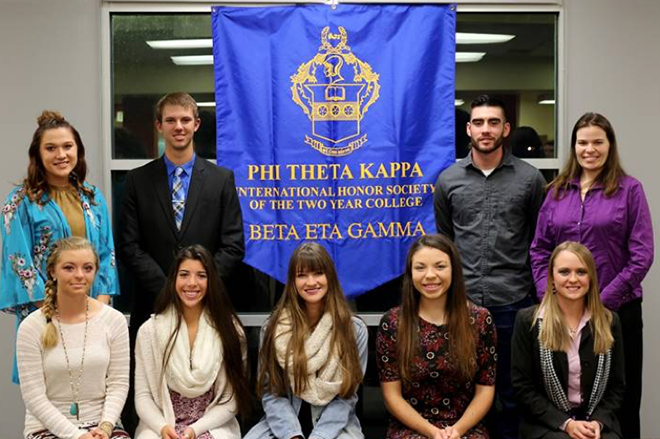 The Beta Eta Gamma chapter of Phi Theta Kappa promotes and honors academic excellence at LCC and is active on campus. To be eligible to become a member, students must have a 3.5 grade-point average after completing 12 or more credit hours of college-level work, be currently enrolled, and pursuing an AA, AS, AGS or AAS degree. Phi Theta Kappa members are eligible to apply for millions of dollars in scholarships each year, as well as gain leadership skills and network with other high achieving college students. Induction of new members occurs every fall and spring semester. LCC's Phi Theta Kappa officers are Mia Cory, President; Travis Struble, Vice President; Alma Chavez, Secretary; and Austen Emick, Public Relations Secretary. For more information on Phi Theta Kappa at LCC, contact David Frankel at 719-336-1547 or Kelly Emick at 719-336-1532. Photo: (Seated) Harley Anstead, Adrianna Ruggieri, Jenaye de Seve, Shelby Hawkins, Sarah Trospter, (Standing) Haleigh Prosser, Tyler Geddes, Miles Hilton, and Laura Lindholm. Not Pictured: Chet Adams, Michelle Batista-Majalca, Dillon Fisher, Mayrene Slatton-McCoy, and Celia Tamayo. Courtesy Lamar Community College.